In the 60’s Bill bought a 16mm Bolex movie camera. (An actual 16mm camera. Not the 8mm that were very popular during the 60’s.) It was a wind up camera – no batteries required, and had no sound. It used 100 ft rolls of film that were pretty expensive to get processed, so the sequences that he did shoot tended to be pretty brief. He never used a tripod, so the video is also a bit shaky. I believe that my brother Scott has the movie camera in his camera collection. Perhaps he will dig up a bit more information about it and post it here. The film was transferred to video tape about 12 years ago by Scott and I just recently converted the tapes to a digital format. I was able to clean up the images somewhat and will be posting short clips starting with this one. At the time that Scott transferred the 16mm film to tape he dubbed them with some music and let grandpa narrate them. Bill would of been in his late 70’s at the time and I think some of his recollections are not completely accurate, but sure is nice to be able to hear his voice. 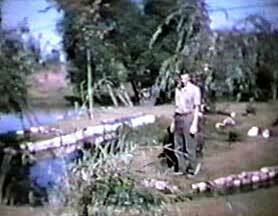 This clip is made up of all the segments that Bill shot of Deltasia Park – circa 1962. Keep in mind that home movie technology at that time was not like today’s video movie cameras so the video clips are a bit ‘rough’. That, coupled with the fact that the film was nearly 40 years old when it was transferred to video tape and then another 12 years passed before the video tape was converted to digital video, and it is a wonder that we are able to watch these movies at all! 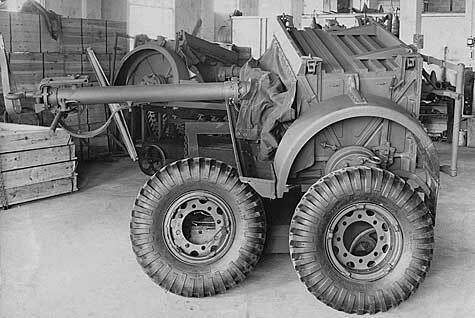 This is the gun carrier that was manufactured by Frost & Woods during the 2nd World War and that Bill was partly responsible for. For many years I thought this was a picture of the actual gun, but while restoring the image I realized that wheels, towbar and frame are arranged to only look like a gun. Not sure if that was deliberate or not. A high resolution TIF file (5 Meg) of this image can be downloaded from here. These images have been scanned and restored, but I have not yet written anything about them. They are in no particular order. 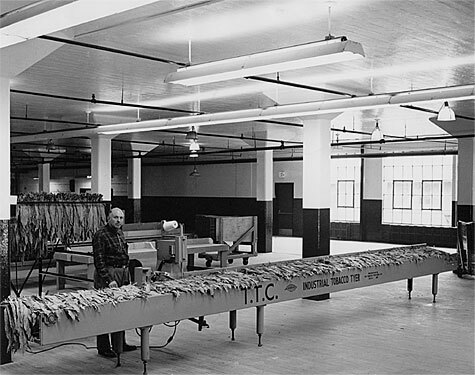 The tobacco tying machine played a significant role in the mechanization of the tobacco industry, and Bill played a small but important part in its development. Up until its invention tobacco was tied onto sticks by very skilled (and very fast!) women. It was hard, back-breaking work, and for many years numerous people had tried and failed to come up with an automated solution. There is more to the story of how the tobacco tying machine came into being. I will elaborate a bit later. A high resolution TIF file (13 Meg) of this image can be downloaded from here. The tying machine was based on a regular sewing machine – complete with needle, looper and thread. The main difference is that the needle was very large (about 8″ long and 1/4″ in diameter), the thread actually heavy duty rayon twine, and the looper very large. 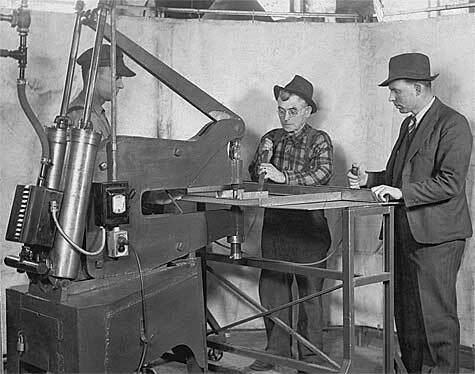 Bill shot a short 16mm film of the tying machine that he designed being used on a farm in 1962. 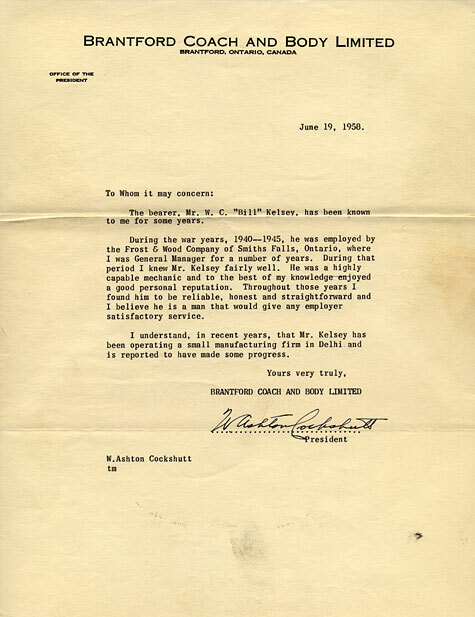 The machine in the picture at the top of this page was a special machine built for the Imperial Tobacco Company. 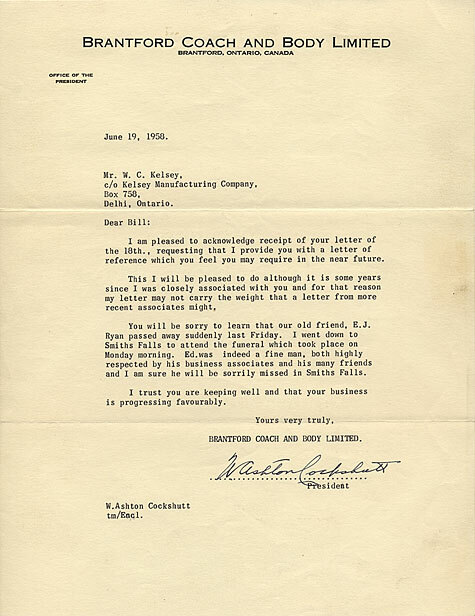 The image was taken in the Reynolds tobacco factory in Delhi, Ontario. As always, if anyone has more details or information about the TTC tying machine and the role Bill played in its development, please post a message with details. 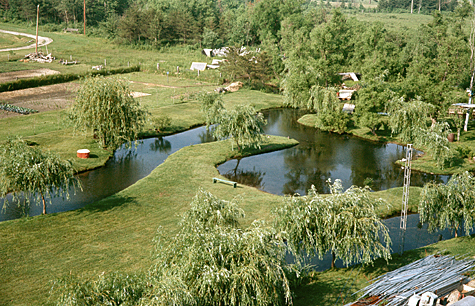 A view of the south west side of the developing park. This image was probably taken from the TV antenna tower. At this point Bill had not started building any of the park “rides” yet. Still developing the landscaping. This image was probably taken around 1964. 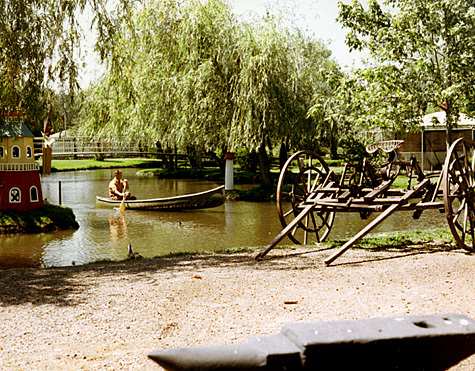 An image of Bill Jr. “Billy” canoeing next to the island with the ornamental bird aviary. 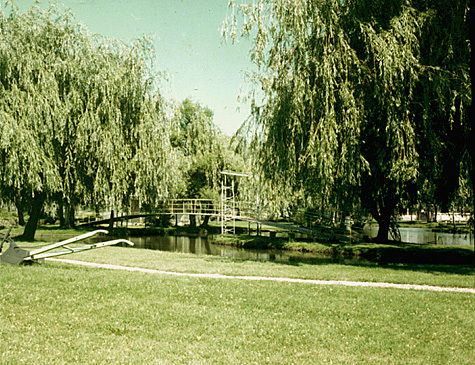 A view of the suspension bridge Bill built for the park. 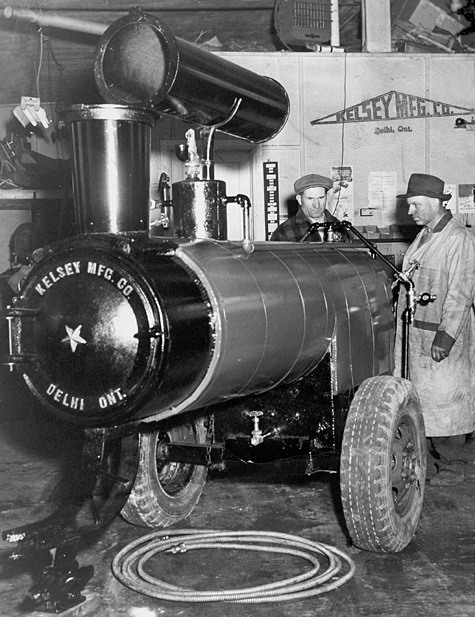 Bill Kelsey and a customer standing next to a new Kelsey steam boiler. For more details about this boiler, see this post. 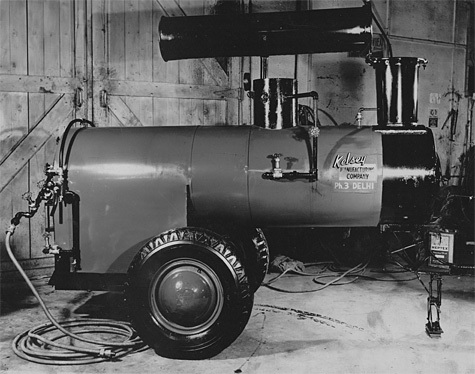 This is a portrait of the classic Kelsey steam boiler. 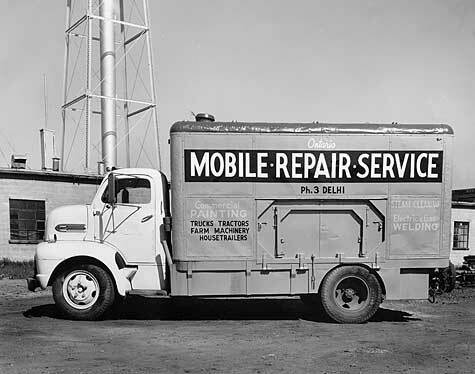 This design was manufactured by Bill’s company from around 1952 until 1960 or so. Several thousand where built and sold from Bill’s little manufacturing shop on Waverly St. in Delhi Ontario. The boiler was used to sterilize the soil in tobacco greenhouses and to humidify and ‘condition’ cured tobacco so that it could be handled without shattering. 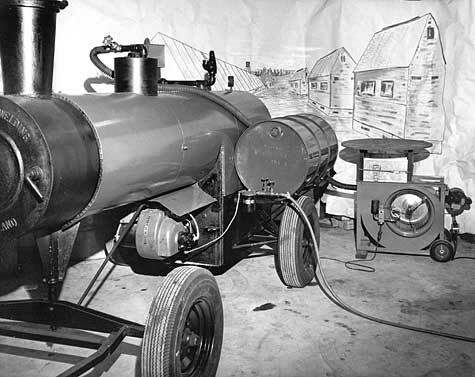 The boiler featured a number of innovative features for the time, including low pressure operation (70 PSI as opposed to 150 PSI that was more commonly used by the old converted steam engines that some farmers used.) Numerous safety features including a firebox fire suppression system (a lead plug at the top of the firebox that would melt and use the boiler water to put out out the coal fire if it got to hot), an overpressure relief valve, and insulated jacketed exterior. None of these features were particularly innovative, but they were unique for an industry that used old converted steam engines that tended to blow up from time-to-time. 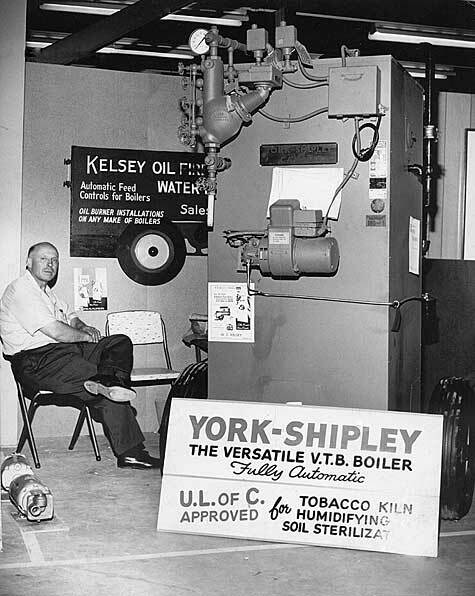 It is probably not an exaggeration to say that this boiler was the leading edge of a massive modernization movement of the tobacco industry that Bill launched with Kelsey Manufacturing. 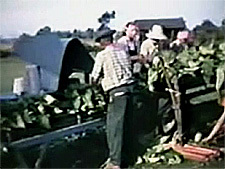 Up until this time the farming of tobacco was highly labor intensive using antiquated equipment and techniques. 50 years later I believe that there are still some of these boilers in operation in Southwestern Ontario, although they are probably exceedingly rare now that the tobacco industry is in its waining years. Scott (my brother) would love to get his hands on one of these intact boilers. If anyone knows where there may be one, let Scott know by email at scott@warris.com. 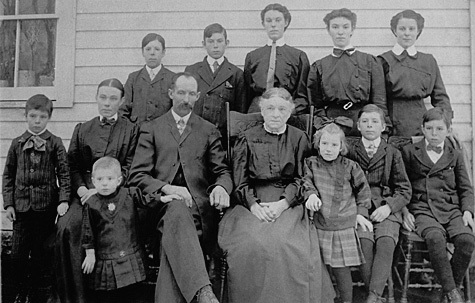 This portrait of the entire Kelsey family was taken in 1913 at the original homestead near Landsdowne Ontario. 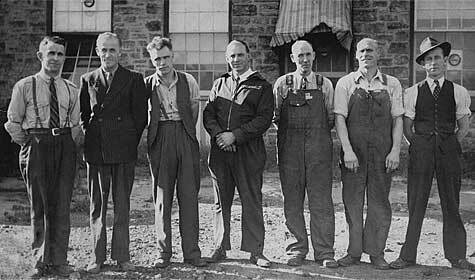 Bill is the youngest in the image. This image was particularly challenging to restore as it had a lot of marks and scratches, but I think it turned out pretty good.